Tioman Island. The sea seen from the backyard at Nazri’s Place, originally uploaded by Brin d’Acier. Here is a view of the beach at Kampung Air Batang on Tioman island, to the east of mainland Malaysia. 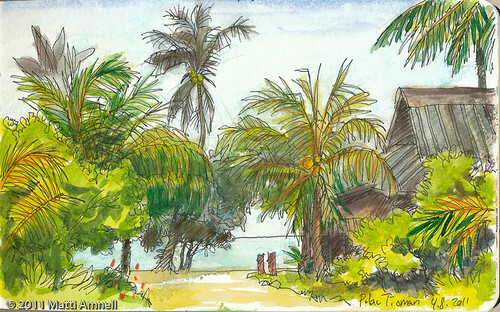 We spent almost a week snorkling the wonderful reefs but of course did no underwater sketches. Tanah Rata, Cameron Highlands, originally uploaded by Brin d’Acier. We spent a week hiking in the temperate rainforests of the Cameron Highlands. 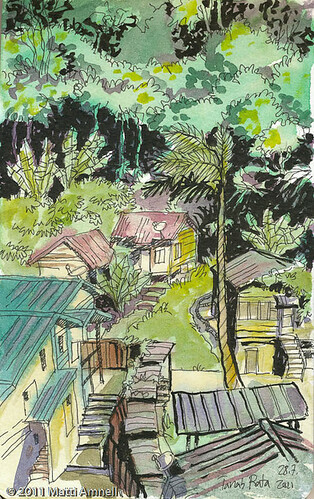 Here is a quiet corner of the village of Tanah Rata. Kuala Lumpur, seen from Chinatown towards the old railway station, originally uploaded by Brin d’Acier. 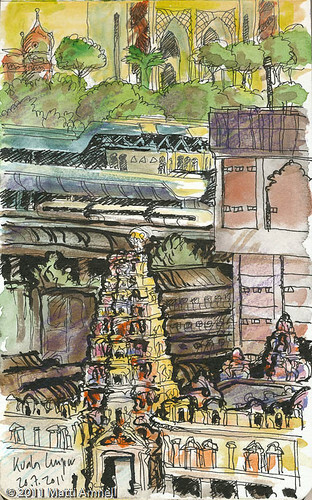 Here’s one of the wonderfully chaotic architecture of downtoen Kuala Lumpur. That’s Sri Maha Mariamman Temple in the foreground.